I know, I know--I'm so behind! You've all definitely read the entire series already, but I just discovered Holly Black's TITHE and oh. my. word. I'm obsessed. How does Holly Black do it?! How does she know all these myths and legends and then weave them into her dark, modern fairy tales? Her creatures are so grotesquely beautiful, too, it reminded me a lot of PAN'S LABYRINTH. Holly Black, she's like the literary Guillermo del Toro. And ROIBEN! Gah! I can't stop squealing about Roiben. There's just something terribly romantic about a tormented knight and that whole medieval steez. Also, I'm a sucker for white/silver hair (umm has anyone been watching GAME OF THRONES on HBO? 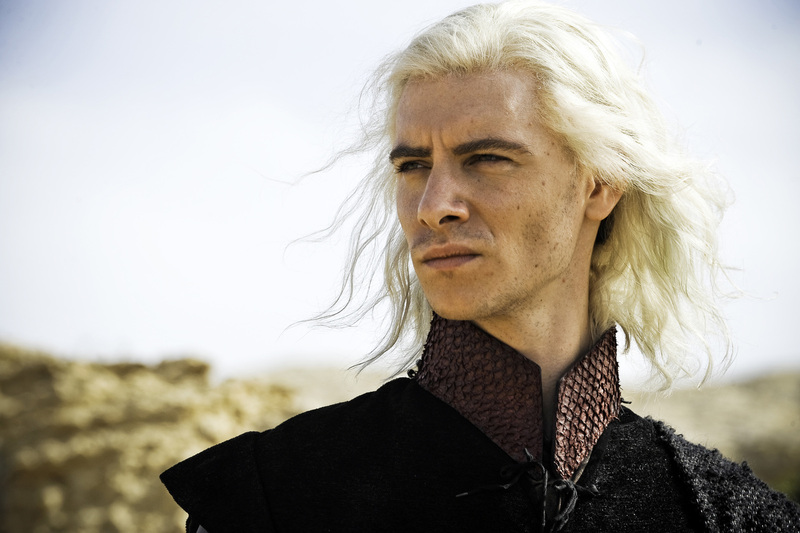 I know Viserys Targaryen is a jerk and all, but the actor is slightly kind of maybe perhaps a bit HOT). I've thought of dying my own hair white, too, but the upkeep just seems too much! Not to mention painful, what with bleaching my roots every other week. ANYWAY, I could read this book a million times and still shiver at Roiben's words. My favorite quotes? I requested the next books, VALIANT and IRONSIDE, at the library (I have a queue there like it's Netflix). Can't wait! You can count on that! I love gushing books with other obsessive fans :) If I get nothing done in the next few days, I'm blaming you! I have not read a Holly Black book yet! I've heard such great things about her too. Thank you for the reminder to put her in my TBR pile! Tithe and Ironside are two of my all-time favorite books! I seriously love them, and I love Holly Black's writing. And yes, Roiben. Need I say more? He's so noble and so tortured. He has so many great quotes: "If you wish me to endure your touch, you must order me to do so." Ouch! Valiant was still good, but I didn't like it nearly as much because it had different characters (though Luis and Dave are in it and Roiben makes an appearance). Once you finish those, don't miss her latest novels: WHITE CAT and RED GLOVE. They're different than her faerie tale series, but I thought they were equally as wonderful. I haven't read any of Holly Black's work, yet. You've made me want to take a look on my next trip to the book store. Viserys is for sure a jerk! My 16-year old loved these books too, although I haven't read them. Great quotes! OGOD. This series was amazing. I've read Tithe alone at least four times. Yeah... I completely understand. It seriously made me wish Roiben were real and I were Kay. Have you read the Wicked Lovely series? It's AMAZING. Now there is a universe that draws you in and makes you wish it were real.